Speaks of Benefit of Equal Suffrage for the Working Woman. 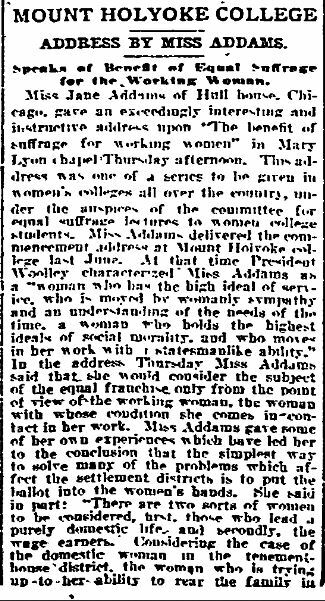 Miss Jane Addams of Hull House, Chicago, gave an exceedingly interesting and instructive address upon "The benefit of suffrage for working women" in Mary Lyon Chapel Thursday afternoon. 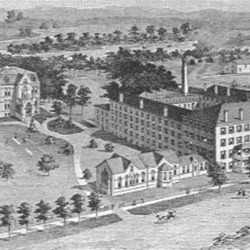 [This] address was one of a series to be given in women's colleges all over the country, under the auspices of the committee for equal suffrage lectures to women college students. 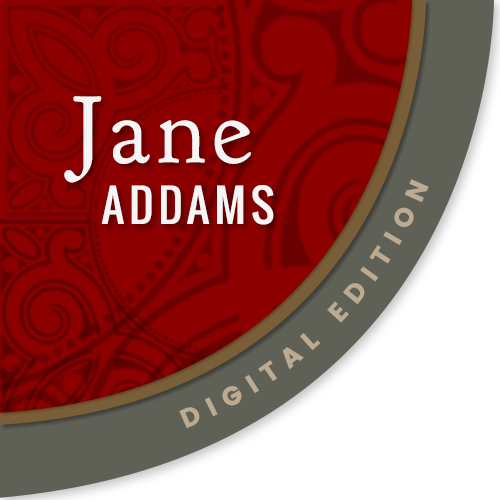 Miss Addams delivered the commencement address at Mount Holyoke College last June. 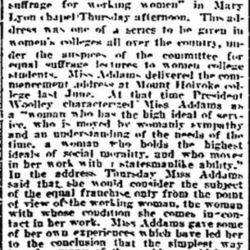 At that time President Woolley characterized Miss Addams as a "woman who has the high ideal of service, who is moved by womanly sympathy and an understanding of the needs of the time, a woman who holds the highest ideals of social morality, and who moves in her work with statesmanlike ability." In the address Thursday Miss Addams said that she would consider the subject of the equal franchise only from the point of view of the working woman, the woman with whose condition she comes in contact in her work. 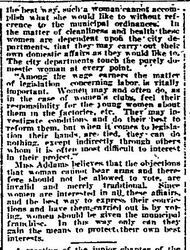 Miss Addams gave some of her own experiences which have led her to the conclusion that the simplest way to solve many of the problems which affect the settlement districts is to put the ballot into the women's hands. She said in part: "There are two sorts of women to be considered, first, those who lead a purely domestic life, and secondly, the wage earners. 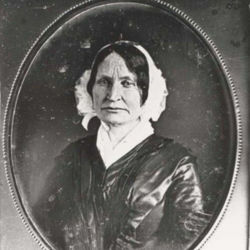 Considering the case of the domestic woman in the tenement-house district, the woman who is trying up-to-her-ability to rear the family in [page 2] the best way, such a woman cannot accomplish what she would like to without reference to the municipal ordinances. In the matter of cleanliness and health these women are dependent upon the city departments, that they may carry out their own domestic affairs as they would like to. The city departments touch the purely domestic woman at every point. "Among the wage earners the matter of legislation concerning labor is vitally important. Women may and often do, as in the case of women's clubs, feel their responsibility for the young women about them in the factories, etc. They may investigate conditions and do their best to reform them, but when it comes to legislation their hands are tied, they can do nothing, except indirectly through others whom it is often most difficult to interest in their project." Miss Addams believes that the objections that woman cannot bear arms and therefore should not be allowed to vote, are invalid and merely traditional. 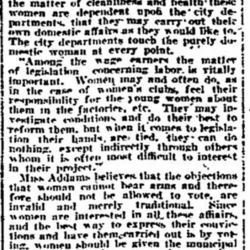 Since women are interested in all these affairs, and the best way to express their convictions and have them carried out is by voting, women should be given the municipal franchise. In this way only can they gain the means to protect their own best interests. 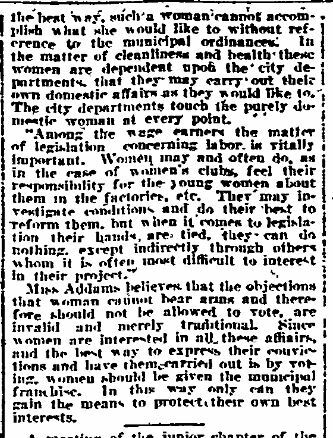 Address by Jane Addams, Springfield (MA) Republican, March 21, 1908, p. 13. Best image possible from Springfield Republican's digital archive. 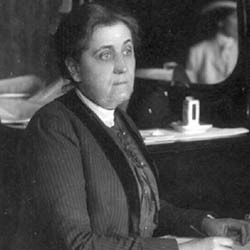 Addams, Jane, “The Benefit of Suffrage for Working Women, March 19, 1908 (excerpt),” Jane Addams Digital Edition, accessed April 22, 2019, https://digital.janeaddams.ramapo.edu/items/show/14793.